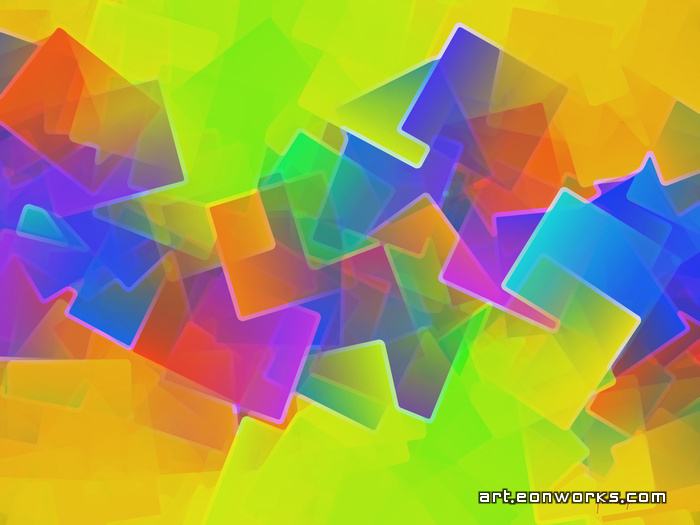 20 November 2011  A new exciting addition to the Drifting Planes series of vibrant colors and forms interwoven in rectangular motion. A few days ago I bought a new 2TB WD external harddrive. It's hard to believe how much space there is on it. I still remember when I got my first 30Mb harddrive for my Amiga back in the early 1990s. That was so exciting. I could load the OS from it really fast and store so many files. It was a huge improvement over a floppy. Anyway, after partitioning and formatting the new 2TB harddrive, I set windows to check and fix all partitions for errors. This took about 6 hours... Then I had to copy all my files from my old 0.5TB harddrive which took about 7 hours because I have so many small files. And I couldn't copy all files at once from one partition to another because windows can't figure this out - after several minutes of preparing to copy it said: too many files (cancel). So I had to copy the files over several steps. But now, everything works fine and the new harddrive mounts faster and doesn't get as warm as the older one, which I will now use for backup.